Our Bhutan Overland Tour is designed for those who want to discover the entire beauty of Bhutan. 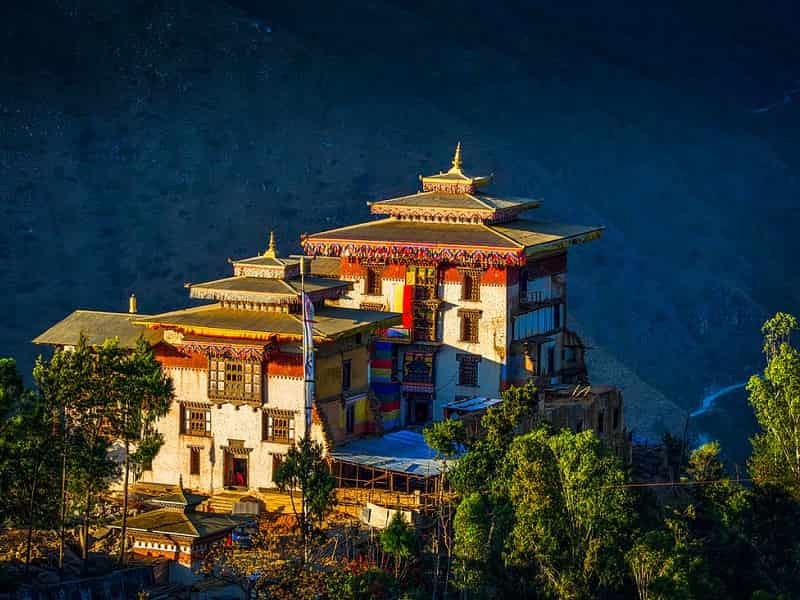 Beginning in Paro, home to the infamous Taktsang Lhakhang (Tiger’s Nest), you will then visit beautiful fortresses, sacred monasteries, remote temples, farm houses, palaces and monastic schools across the country to the eastern border town of Samdrup Jongkhar. Upon arrival in Paro International Airport, you will be welcomed by our Asia Senses guide in a Bhutanese style with Tashi Khada (white scarf), then be transferred to your hotel for refreshment and a brief discussion on tour program. (Your itinerary shall be flexible and our guide shall give you options based on your interest). After a short break, start this Bhutan Overland Tour by a visit to Paro Dzong which was converted into the National Museum in 1968. In this museum, there are over 3000 artworks and masterpieces that display more than 1500 years of cultural heritage of Bhutan. Then we will visit Rinpung Dzong (or Ta Dzong) which is located near to the museum. It was consecrated in 1645 by Shabdrung Nawang Namgyal on the site of smaller fort. Its name means “the fortress of the heap of jewels”. Today, this massive fortress is the seat of the district administration as well as the home for the monastic school. Next, we head to 7th-century Kyichu Lhakhang, one of Bhutan's oldest and most beautiful temples. The temple is popularly believed of the 108 temples constructed by the Tibetan King Songtsen Gampo. Overnight in one of the carefully selected hotels in Paro. After breakfast, we will take a short transfer to the ruins of 17th-century Drukgyel Dzong which was a fortress and Buddhist monastery, now in ruins, located in the upper part of the Paro District. In good weather conditions, the towering peak of the sacred Mount Jomolhari (7314m) appears as a stunning backdrop. Then we drive to Tiger’s Nest parking area where you begin your hike to the Taktsang Monastery. It was constructed in 1692, around the cave where Guru Rinpoche first meditated, the event that introduced Buddhism into Bhutan. Legend has it that in 8th century Guru Rinpoche flew to this exact spot from Tibet on a back of a tigress, thus giving it the name “Tiger’s Nest”. All Bhutanese Buddhist desire to come this monastery at least once in their lives. This hiking trail takes around 5 hours for round trip to hike to the monastery and come back. The trails pass through the meadow of pines, rhododendrons and oaks. On the way back, stop then have lunch at the cafeteria. The rest of day, you could take a stroll in Paro town, visit handicraft and souvenir stores or take rest and relax at the resort. Today, we will drive to the Haa valley via Chele La Pass (3,988m) which separates Haa and Paro. It is one of the highest road pass in Bhutan, snaking upwards through blue pine and rhododendron (Etho Metho) forests for 35 km. On a clear day, the view sweeps away to the snow-dome of Bhutan's second highest peak, Mt. Jomolhari (7, 314m), and down to the Haa Valley, which only opened to foreigners in 2002 due to its proximity to the border with Sikkim and Tibet. Continue the drive to the Haa valley afterwards. The pristine Haa valley is the smallest Dzongkhag in the country. It was opened to tourists since 2002 and has remained beautifully quaint and untainted by the influences of modern development. This has helped keep Haa the way its always been, with Bhutanese families living their traditional and simple life. The town is surrounded by forested hillsides full of ancient shrines, while the narrow valley floor is dotted with fields of millet, barley, and potatoes. 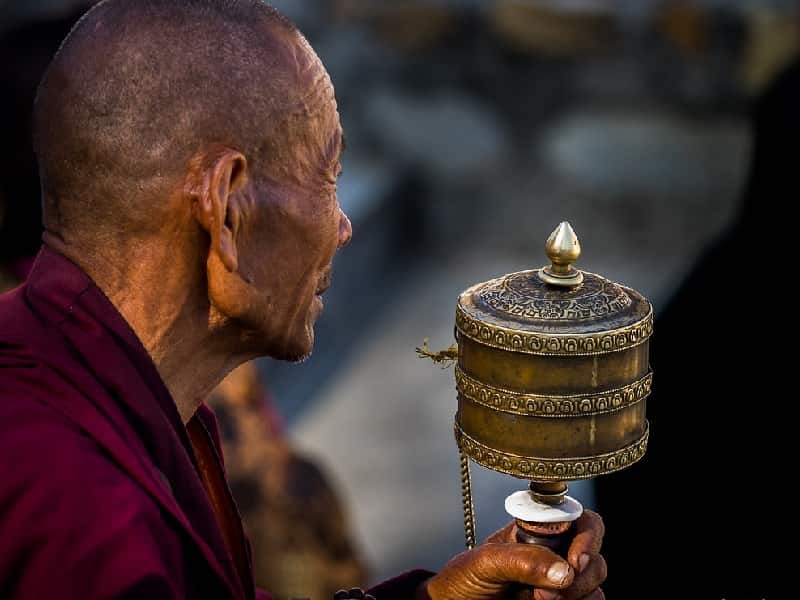 Upon arrival at the Haa valley, we will walk through the serene hamlets and remote monasteries below mountain peaks like Lhakhang Karpo and Lhakhang Nagpo which were established in the 7th century by Tibetan king Songtsen Gempo in his mission to build 108 monasteries in one day. The rest of day, we take a leisurely drive to the beautiful valley and stroll around the remote town of Haa. This morning, drive to Thimphu, the capital city and the main center of commerce, religion and government of Bhutan. The drive takes about three and half hour to reach Thimphu, on route, enjoy this lovely drive through wonderful landscape and remote settlements and watch houses and buildings are painted and constructed in traditional Bhutanese style. Upon arrival, pay a visit to the Buddha Dordenma Statue to have an outlook of the city and for a stunning view of the valley. This gigantic Shakyamuni Buddha statue measures in at a height of 51.5 meters, making it one of the largest statues of Buddha in the world. Then we take a visit to National Memorial Chorten, one of Thimphu's most iconic monuments. It was built in 1974 as a memorial to the third king, Jigme Dorji Wangchuck who reigned from 1952-1972. 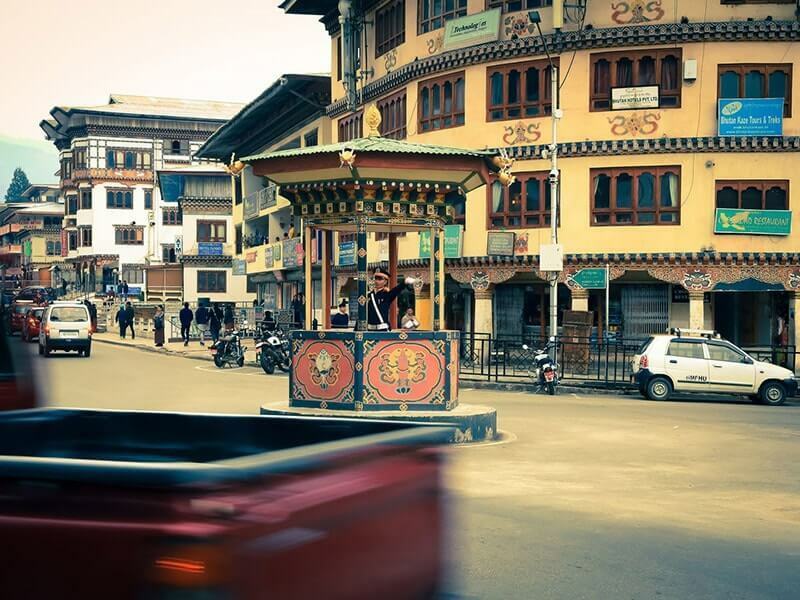 It is the favourite place for the people of Thimphu to pray and show their devotion. Afterwards, we take a view of the majestic Tashichho Dzong which is located close to Thimphu town, next to the banks of the Wangchhu River. Today, Tashichho Dzong houses the secretariat, throne room, and offices of the King of Bhutan. Overnight in one of the carefully selected hotels in Thimphu. 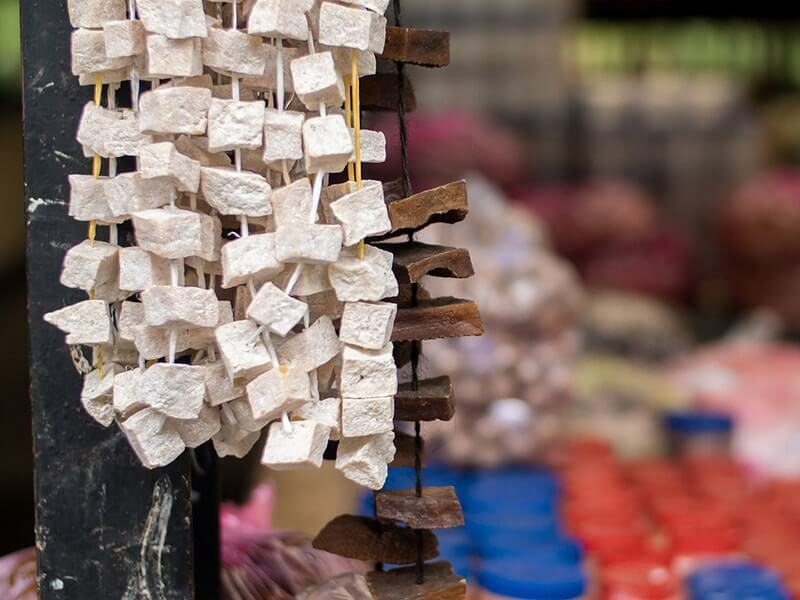 NOTE: If your Bhutan tour coincides with Thursday - Sunday, we head to Thimphu weekend market which is the main source of fresh produce for Thimphu city. Farmers come from all over the country to sell their farm products (vegetables from farms and wild ones collected from forests, fruits, etc) and livestock products (mainly cheese and butter). After breakfast, head north to visit Pangrizampa Monastery which was built in the early 16th century. This two 16th-century buildings complex is a college for traditional astrology. 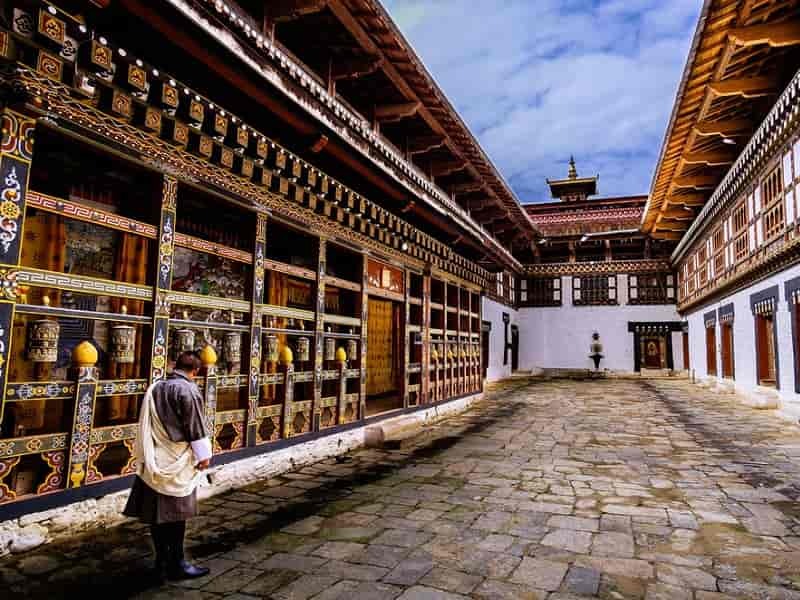 Then we head to Chagri Dorjeden Monastery, a Buddhist monastery in Bhutan established in 1620 by Ngawang Namgyal, the first Zhabdrung Rinpoche, the founder of the Bhutanese state. It was built on the riverside with the river flowing with crystal clear water. After that we drive back to Thimphu for the lunch. After lunch, take a visit to Changangkha Lhakhang Monastery which was built in the 12th century and is the oldest temple in Thimphu. 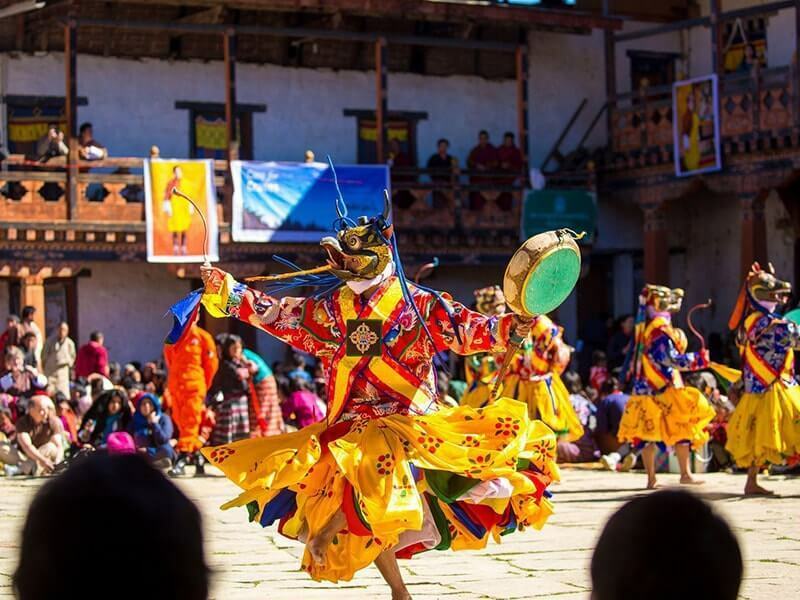 Then visit Thimphu Institute of Zorig Chusum where you can catch a glimpse of apprentices honing their skills and knowledge in 13 traditional arts and crafts of Bhutan. Continue on to Royal Textile Academy to witness the traditional art of weaving and Folk Heritage Museum Kawajangsa which is providing a detailed insight of the entire folk history and heritage of Bhutan. Later, we visit the traditional handmade paper factory where they produce paper manually from the bark of the plant called Daphne. After breakfast, visit Simtokha Dzong, one of oldest Dzong in Thimphu that was built in the year 1629 by Zhabdrung Ngawang Namgyal, who unified Bhutan. Afterwards, we depart Thimphu for Punakha, enroute stop to visit Dochula Pass at an altitude of 3150m dotted with colorful prayer flags and 108 Stupa. If the weather is good enough, you could watch the spectacular views of the Eastern Himalayan Mountain ranges while enjoying a hot cup of coffee/tea at the Dochula café. Then continually drive to Punakha through the temperate forest of rhododendron & magnolia and orange, banana, rice plantations along the way. Have your lunch at a local restaurant. 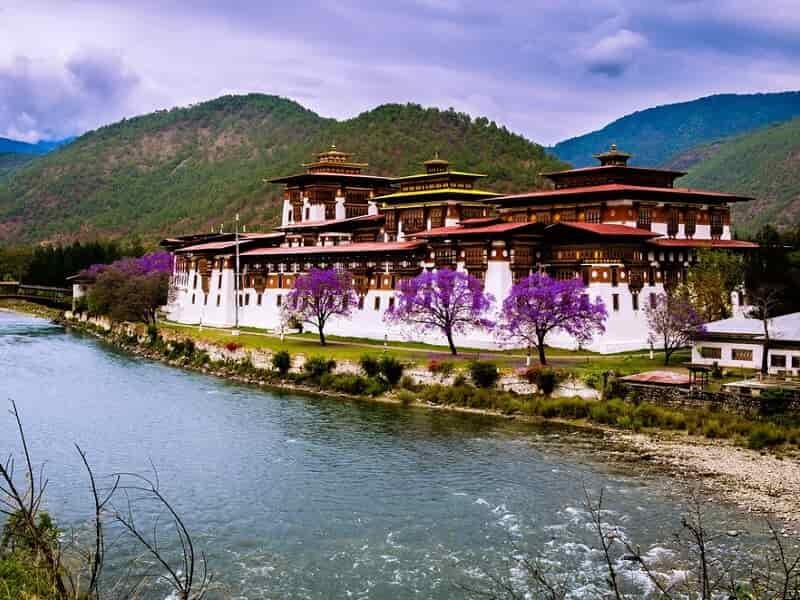 Visit Punakha Dzong which is arguably the most beautiful dzong in the country and one of the must-visit places in all Bhutan tour packages. This dzong has a special significance in Bhutan history as is the place where Ugyen Wangchuck (first king of Wangchuck House) was crowned in 1907. In the evening, you can take a leisurely walk in Punakha town if you aren’t tired. In the morning drive to Yabesa village and hike to through rice fields and up to Khamsum Yulley Namgyal Chorten which sits high above Punakha Valley, affording panoramic views of the verdant hillsides below. It was built by Queen Mother and dedicated to the King and for the wellbeing of Bhutanese. After that, we drive to Phobjikha valley which takes approximately three hours. Phobjikha is a glacial valley on the periphery of the north western tip of the Black Mountain National Park. It is one of the most beautiful spots in Bhutan and the winter home of the endangered black necked crane that migrate each year in winter from its northern habitats in Tibet and Siberia to these grounds. Upon arrival at the Gangtey Valley, we will take a visit to Gangtey Goemba, an important monastery of Nyingma school of Buddhism. If the time permits, we will hike on the Gangtey Nature Trail which takes you through the blue pine forest to a remote little village. At dawn you could take a walk out into the serene valley of Phobjikha to enjoy the sunrise. After breakfast, we will take a transfer to Jakar Valley (Bumthang). This journey will be filled with dramatic landscapes taking in terraced fields, deep river valleys and small hill villages viewed from the highway. 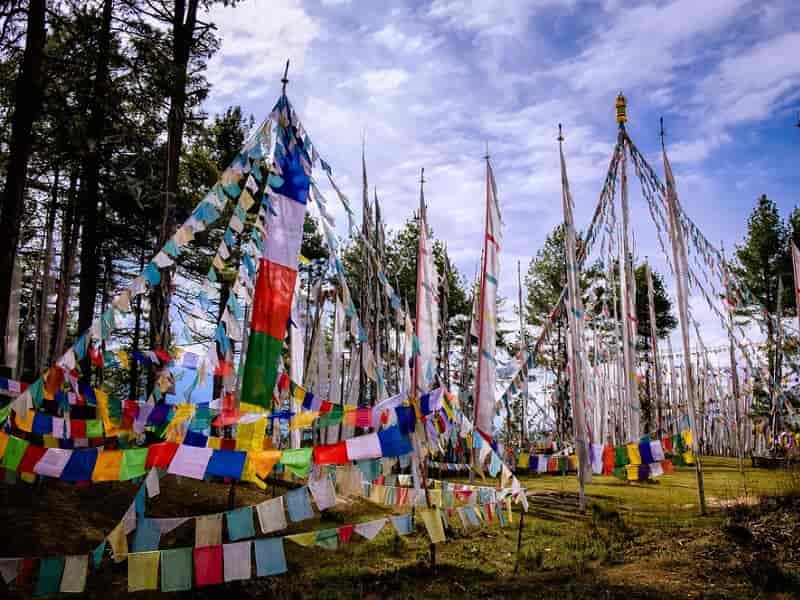 The drive will take you across Pele La Pass (3,300m), which is marked by a chorten and an array of prayer flags. Along the way, we stop to visit Chendebji Chorten which was built in the early 18th century in the style of the great Swayambhunath Stupa of Nepal. It was built by Lama Zhida, to cover the remains of an evil spirit of a gigantic snake that was subdued at this spot. Arrive in Trongsa, located near the center of Bhutan and was considered crucial to controlling the kingdom in earlier years due to its strategic position. Visit Trongsa Dzong, an important administrative building, providing the headquarters of the government of Trongsa District. It is considered one of the most spectacularly sited Dzongs in Bhutan, with a sheer drop to the south that often just disappears into cloud and mist. The drive takes you over the picturesque Yotong La Pass and down into Chhume Valley home to Bhutan’s famous Yathra weaving. Visit a village of Zungney in Chumey, observe ladies weaving yathras. You may be able to see the dyeing of wool using natural dyes and other processes. On arrival at the Jakar Valley, visit Kharchu Monastery which is one of the biggest Buddhist colleges of Bhutan. This point offers great view of the Bumthang valley and its town. In the evening, you could walk around this peaceful town of Bumthang. Overnight in one of the carefully selected hotels in Bumthang. After breakfast, our guide will take you to visit Jakar Dzong, literally meaning “castle of the white bird” is located on picturesque location overlooking the Chokhor valley. Its official name is Yuelay Namgyal Dzong, in honour of the victory over the troops of Tibetan ruler Phuntsho Namgyal. In the late afternoon, we drive to visit the extensive Wangdicholing Palace which is built in 1857. The palace served as the principal summer residence of the first and second kings of Bhutan. After breakfast, drive to visit Membartsho (the Burning Lake) which is one of holiest lakes in the country and is believed to be a wish fulfilling lake. When a local visits this lake they tie a coin inside a white scarf, make a wish and offer it to the lake. It is believed someday the wish will be fulfilled. Explore further afield with an excursion to the beautiful Ura Valley. This beautiful valley offers several off-the-beaten path lhakhangs and monasteries, along the way. Ura valley house an interesting village with about 40 closely packed houses at an altitude of 3100m. The people here still live a semi nomadic lifestyle by herding yaks and sheep. Stroll around the village with your guide and experience the warmth & hospitality of the local villagers. Have a traditional dinner with a Bhutanese family. Overnight at a homestay in Ura. After a homemade breakfast in Ura, gear up for a fantastic drive to Mongar. The road approaching Mongar is one of the most spectacular journeys in the country. From Ura, the road enters the Phrumsengla National Park, climbing the overhanging cliffs, cedar trees, passing road worker's campsites before reaching Thrumshingla Pass (3780m). This is the second-highest mountain pass in Bhutan, connecting its central and eastern regions. If the weather is good, you can also catch a glimpse of the Gangkar Puensum, the highest mountain in Bhutan. Once crossing the pass, a 105 km drive will take you to Mongar town in eastern Bhutan. Like most of the prominent towns and villages of eastern Bhutan, Mongar is situated on a hill top (altitude 1600 m) rather than within a valley. This town is the main trade and travel hub of eastern Bhutan. Upon arrival, visit Mongar Dzong which was established in 1930s to replace the original Shongar Dzong. It was constructed in the same way as all earlier dzongs, without plans or nails. If the time permits, visit other dzongs and villages located near from the town. In the evening, you may walk around the Mongar town and interact with the locals. 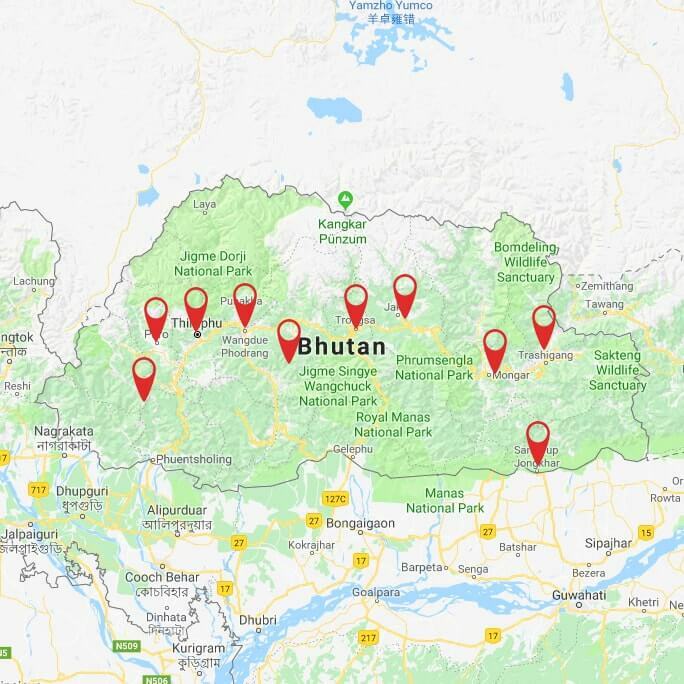 Today, we will take a visit to Lhuentse, one of the most isolated districts of Bhutan, located about 67 km from Mongar. The drive takes you alongside cliffs high above the river valley and dense coniferous forests. Lhuentse is famous for its weavers, and their distinctive textiles are generally considered to be the best in the country. This highly sophisticated and exquisite silk textile is called the Kishuthara, and is a major attraction for tourists. Lhuentse is also the ancestral home of the present monarchy. Have your picnic lunch along the way. On arrival, take a visit to Lhuentse Dzong which sits upon a hill overlooking the Kurichu River. It was constructed in 1654 by Chogyal Minjur Tempa, governor of Trongsa. Stroll around Lhuentse town then visit local surrounded villages. Explore the lifestyle and culture of villagers with our guide. Afterwards, pay a visit to some weaving workshops to learn the art of Bhutanese traditional weaving. At the end of day, we drive back to Mongar. After breakfast, enjoy a scenic- 3-hour drive to Trashigang. 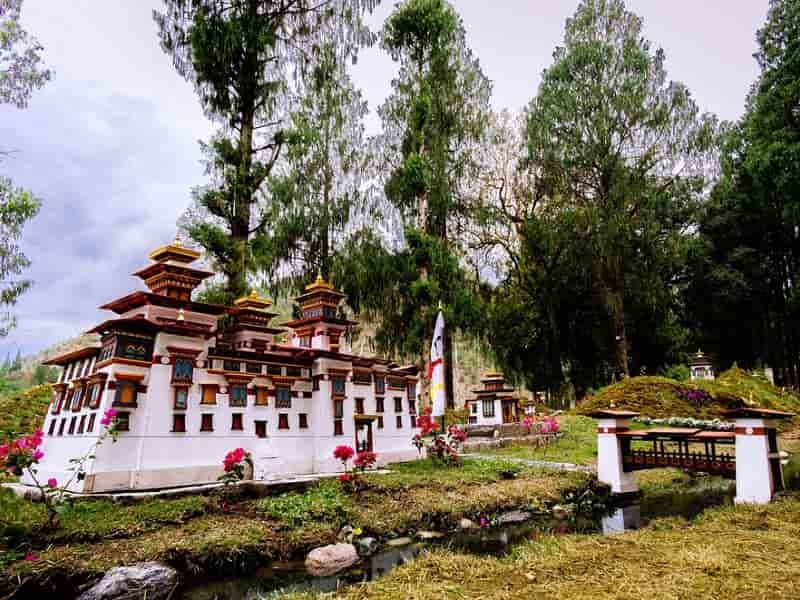 The road will take you through deep forests of mainly rhododendron trees passing KoriLa Pass (2400m) marked by a pretty Chorten and stone wall. There is a chance to stop to enjoy a cup of tea or coffee while watching the spectacular view of Himalayas. After that, drive through corn and mustard fields to arrive Yadi village then stop at a farmhouse and photograph weavers making natural dyes from native plants. From Yadi village, the meandering road drops to Sherichhu valley, then meet Drangme Chhu river and the roads winds in and out of the side valleys to Thungdari which is 20 km from Trashigang town. Along the way, we cross roadside sheds where oil is extracted from lemongrass. The road climbs up for about 20 minutes to Trashingang which situated at the slope of a rocky mountain. Trashigang is the largest town in the eastern region and was once a bustling trade center for merchants looking to barter their goods in Tibet. The traditional architecture and narrow streets give the town a quaint and snug feel. Upon arrival, visit Trashigang Dzong which is situated high atop a spur overlooking the Dangmechu River. It was built in 1659, to defend against Tibetan invasions. After that, we take a walk around Trashigang’s unique town and visit some local shops & some friendly bars. After breakfast, we will take a transfer (56 km) to Trashi Yangtse which is situated in a small river valley at the altitude of 1715 meters. This district is very near to the Tibetan border and it borders the Indian state of Arunachal Pradesh. In the past, there is a trade route between east and west Bhutan passed through here. Trashiyangtse is center of paper making and the art of making wooden cups and bowls. En route, we take a visit to Gom Kora which is surrounded by terraced rice fields. The myth said that Guru Rinpoche subdued an evil dragon which used to attack the villagers. And crushing it into the rock. Then he meditated here and left a body impression on the rock. The temple was built here in 17th century by Minjur Tempa, above the large rock with meditation cave underneath. Afterwards, visit Doksum village which is a few kilometers from Gom Kora. Take a look around the village and see women busy in weaving traditional Bhutanese fabric. Upon arrival in Trashiyangtse, drop by Chorten Kora a large stupa patterned after the famous one of Boudha in Nepal. The stupa is entirely whitewashed and is ideally situated next to the running brook. After that, visit the Institute for Zorig Chusum “School for Thirteen Traditional Arts and Crafts” in Trashiyangtse. This school was opened in June 1997, and it reflects Bhutan’s effort to provide opportunities for vocational training. Followed by a walking tour around the wonderful town of Trashiyangtse. At the late afternoon, we drive back to Trashigang. Today, we take a winding drive from Trashigang to Samdrup Jongkhar (180 km) which takes at least six hours. After leaving Trashigang town, the road winds its way up, through terraced fields up to Kanglung. Stroll around the town and visit extensive campus of Sherubtse College followed by a short visit to Kanglung Zangdopelri Lhakhang which was built in 1978 by the late Minister of Home Affairs, Tamshing Jagar. Continue our drive to Khaling town where we stop to visit the post office for stamp collection. After Khaling the road traverses above the small villages, fields and crosses Kharungla (2350m). Curling around the ridges and narrow valleys, arrive at the pleasant town of Wamrong. Have lunch at a restaurant in Wamrong. After lunch, we take a walk around the peaceful town of Wamrong. When you reach the Mirror Cliff or Melong Brak in Sharchopkha, the most famous landmark on the Trashigang – Samdrup Jongkhar highway. Your guide will assist you to put the windhorse flags on the trees. It is believed that the flags will brings blessing and protection to their hangers. Upon arrival in Samdrup Jongkhar, check in hotel. Enjoy our farewell dinner then free to shop or walk around. Today the Bhutan Overland Tour: Paro to Samdrup Jongkhar wraps up. After breakfast, our guide will arrange an Indian vehicle to transfer you to Guwahati, the capital town of the Indian north-eastern state of Assam, for your onward flight. Our Asia Senses guide and driver will bid you farewell at the Bhutan – India border gate.